Simple. Quick. Delicious. 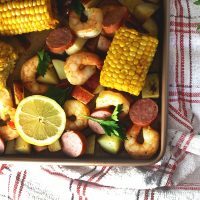 The best darn shrimp boil you will ever make or eat! This is one of thos recipes that in inspired by a plate that I had out. It wasn't long before I was set to move from Cleveland. Two of my close girlfriends and I went to this restaurant that one of them insisted we had to try. She warned us. “Keep an open mind”, she said, “It'll be really good and so much fun“. It depends on whether you call eating with your fingers in toddler fashion but with gloved hands, fun. As always, I had a good time with my friends, but I was not happy about how we went about dinner. But one thing she was totally right about, It was tasty. It was really good! I left there thinking, there has to be a better way to get that taste, without all the mess. So I got in the kitchen and made it happen! While the one that we had out, included crayfish, this one that I am sharing with you today, does not. While I didn't not like them, they are not something that I have to have. 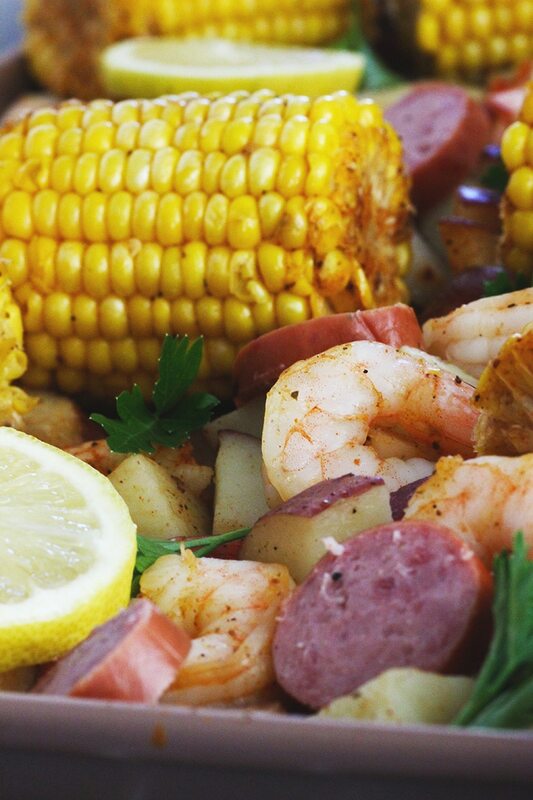 For this shrimp boil the Old Bay seasoning along with the other spices gives a mild kick of spicy flavor. 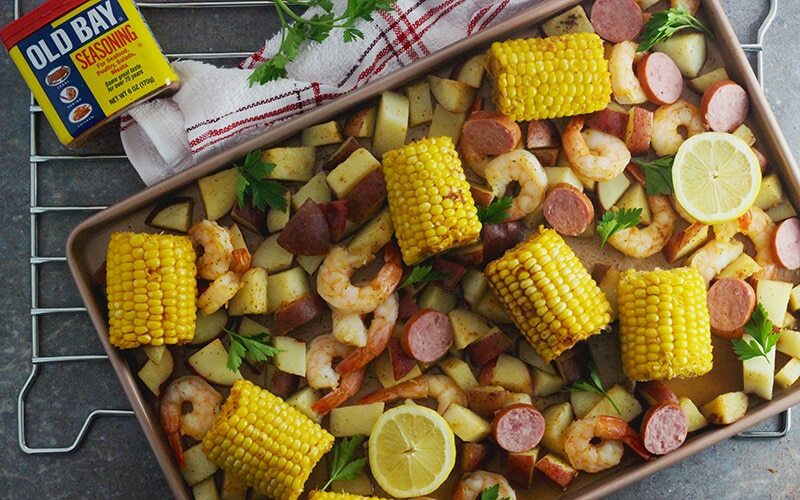 Not inclusive of seasonings, all you need is a good 4 main ingredients to arrive at all of this yum! Red skin potatoes, being my favorite kind of potatoes, is what I use. 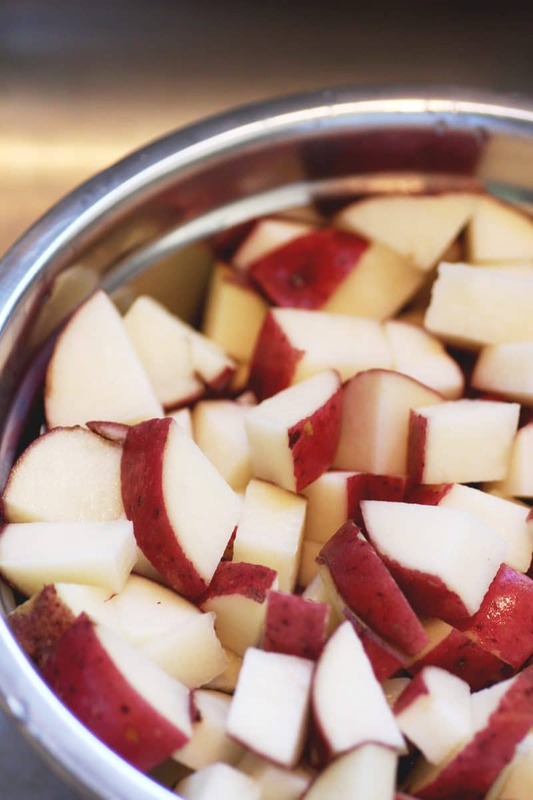 You could probably use regular russet potatoes if you wanted, but I say go red! The finished recipe is every bit worth the minimal time spent. Did I mention this could be made in right around thrity minutes?? Cut up potatoes into small squares. Put on large pot to boil. Boil potatoes actively for 10-12 minutes. Add corn in the same pot for 5-7 minutes. Remove from heat and drain potatoes and corn. In a large bowl, combine all ingredients and seasoning. Mix well. I put in a large bowl with lid and shake up really well. But could stir as well. 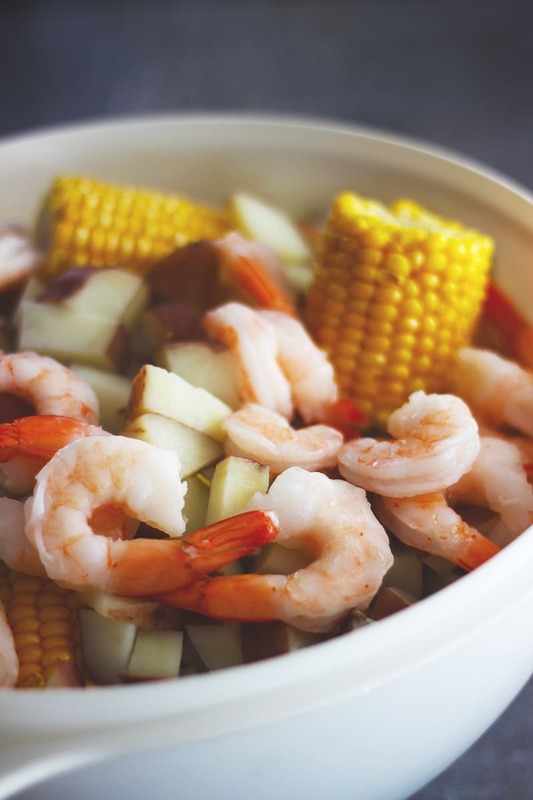 Spread out over baking pan and bake for 25 minutes or until shrimp is fully cooked and potatoes are tender. Shrimp will have a tighter curl to them when they are done. 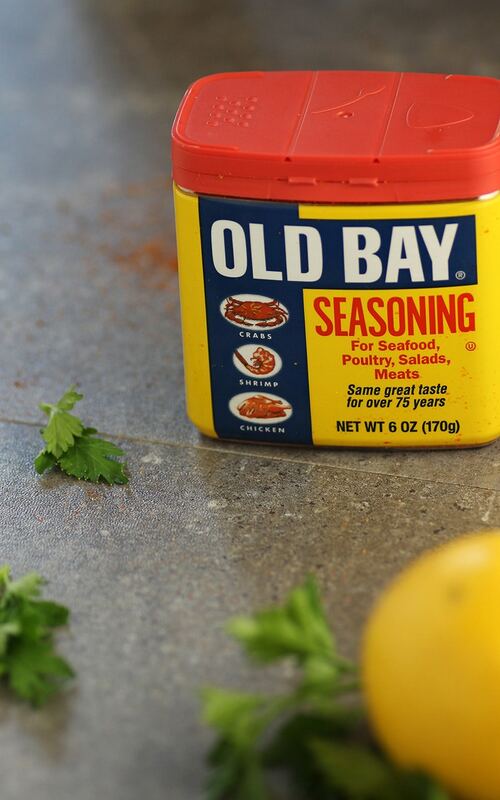 There is a slight spice to this because of the Old Bay Seasoning. If you want to decrease it, decrease the amount of Old Bay used.If using smaller sized potatoes you may need to add more. 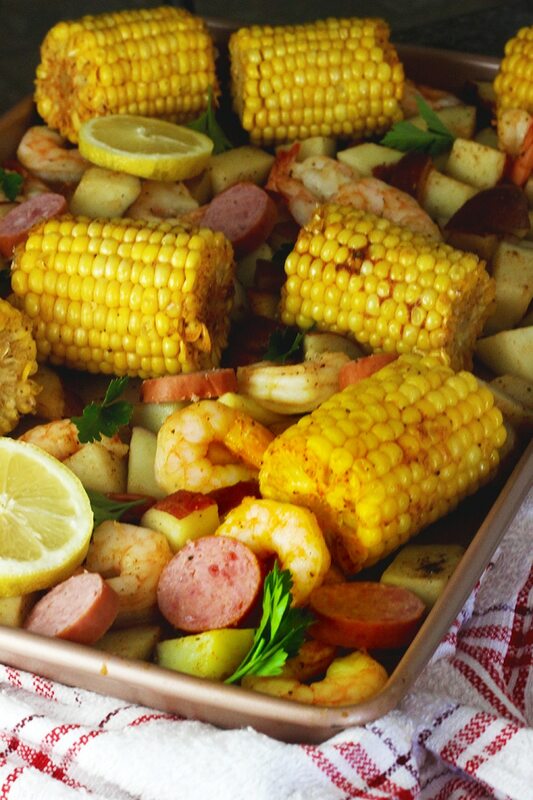 WANT TO SAVE THIS SHEET PAN SHRIMP BOIL TO MAKE FOR LATER? PIN IT TO YOUR FAVORITE BOARD FOR LATER!